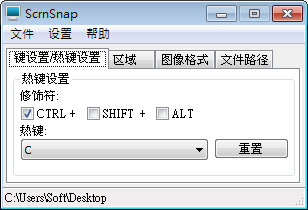 ScrnSnap Portable is a free, simple and of course, very easy to use. The best thing about it is being a portable application, as it doesn't have an installer and it saves the settings using INI file located inside the application's folder. ScrnSnap Portable uses user-defined hotkeys to capture high quality images of multiple formats, including PNG, JPG, BMP, GIF TIF, EMF and WMF.